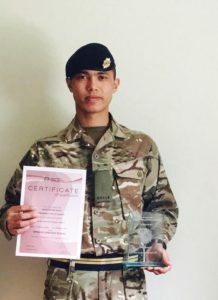 Congratulations to Private Jiban Shahi of 10 Queen’s Own Gurkha Logistic Regiment for securing ‘Top Student’ on the Logistic Specialist Supply Course Class 2 Course. The Class 2 LSS course aim is to develop existing Logistic Specialist (Supply) technical knowledge and to provide an introduction to 1st Line Optimisation (1LO) & accounting procedures in direct support to Manoeuvre Battlegroups and Infantry Battalions. In his peer group from across and the Royal Logistic Corps, the students were tested in all aspects of their trade work. This is to prepare them for leading teams both in UK and on operations. Throughout all of the summative assessments, Private Shahi achieved excellent results, which is testament to his character and exceptional work ethic. As a result, he was awarded the Top Student accolade – an exceptional achievement against tough competition and one that will propel him forward in his career.